Thanks to whale shark sightings reported by the public off the southwest Florida coast in early June, scientists from Mote Marine Laboratory located five of the polka-dotted, filter-feeding giants and tagged two of them with tracking devices on the afternoon of June 14. 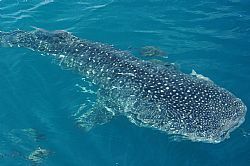 All five whale sharks were found offshore of Longboat Key and New Pass, feeding at the surface possibly on fish eggs as well as other forms of plankton. The first shark, a 16-foot-long male nicknamed “Colt,” was tagged around 12:30 p.m., about 40 miles offshore of Sarasota County. As the team was traveling back to shore around 2 p.m., they found and tagged a 22- to 25-foot female nicknamed “Minnie” and photographed her unique spot patterns for later identification. Three more whale sharks were found and photographed in a group closer to shore. The trip was made possible by Captain Wylie Nagler, owner of Yellowfin Yachts, who transported the research team on his large vessel, allowing them to travel far and fast enough to locate the animals. The tracking tags will store data about the whale sharks’ location, and the depths and temperatures they encounter.